What is it about mountains that strikes that primordial chord of awe, wonder, respect and admiration? These were the questions running through my mind as I sat in my comfortable seat and watched “Meru,” a mesmerizing and award-winning Sundance film. Meet Conrad Anker, Jimmy Chin and Renan Ozturk, three well-known and experienced climbers, who decide to climb one of the hardest mountains in the world. We are not talking of a regular Alpine mountain, but the “Anti Everest” of a Himalayan mountain that is crowned with a sheer vertical wall called “Shark’s Fin.” Conquering this Shark’s Fin of Mount Meru in the Garhwal Himalayas in the Indian state of Uttarakhand is a dream for mountaineers. A handful of experienced mountaineers have had to reluctantly abandon this difficult and arduous climb where you carry your own food, water and other supplies. “Meru” is a spell binding narrative. 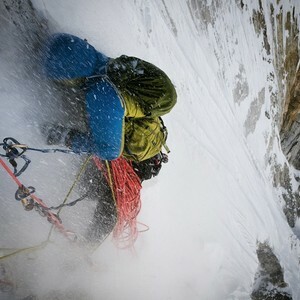 This film is not just about climbing. It is about the inner and outer journeys of 3 brave climbers. This is a film about trust, bravery, anxiety, remorse, injuries, conquering your inner demons, learning to be calm and still relentlessly pursue your dreams. These are emotions many of us experience in our everyday lives in varying degrees. Now imagine climbing a peak where it is just the three of you and you have to be prepared for all sorts of risks and unknowns and don’t have the luxury of calling 911. That is a scary place to be for most of us. I don’t know about you, but it certainly is for me. And when Anker, Chin and Ozturk finally conquer the mountain they made it look as if they were shimmying up a coconut tree. Stay tuned we have an interview with Anker, Chin and Elizabeth Chai Vasarhelyi. “Meru” is screening at this year’s San Francisco International Film Festival (SFIFF). Photo courtesy of Meru Film.